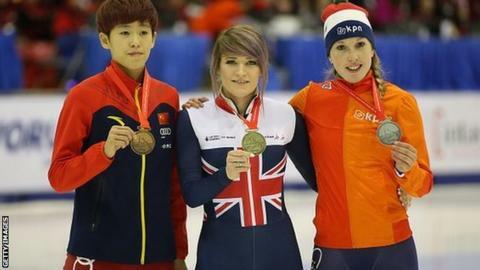 Olympic short track speed skater Elise Christie won 500m gold and 1000m silver at the Toronto World Cup in Canada. Her 500m time of 44.670 seconds beat European champion Lara van Ruijven [44.9 secs] and Olympic silver medallist Fan Kexin [56.1 secs]. Christie, 25, suffered an ankle injury in August after a team-mate collided with her and only recently returned. "I'm super happy because I didn't think I'd even be here racing yet, never mind picking up a medal," Christie said. "Thank you to everyone who has supported me and helped me get back," she added. It is the first time the 1,000m specialist has won a 500m World Cup event. Christie was controversially disqualified three times at the 2014 Sochi Winter Olympics but won two silver medals at last season's World Championships. Despite her recent injury setback, the skater looked strong en-route to the 500m final in her comeback event at the season-opening World Cup in Montreal last week before crashing in the last round and finishing fourth. Her second place in the 1000m event in Toronto was a further encouraging sign, finishing behind Olympic 3000m relay champion Suk Hee Shim of South Korea and ahead of former Canadian world champion Valérie Maltais.